Hey there everyone! Been a while, but I decided to write a little again. 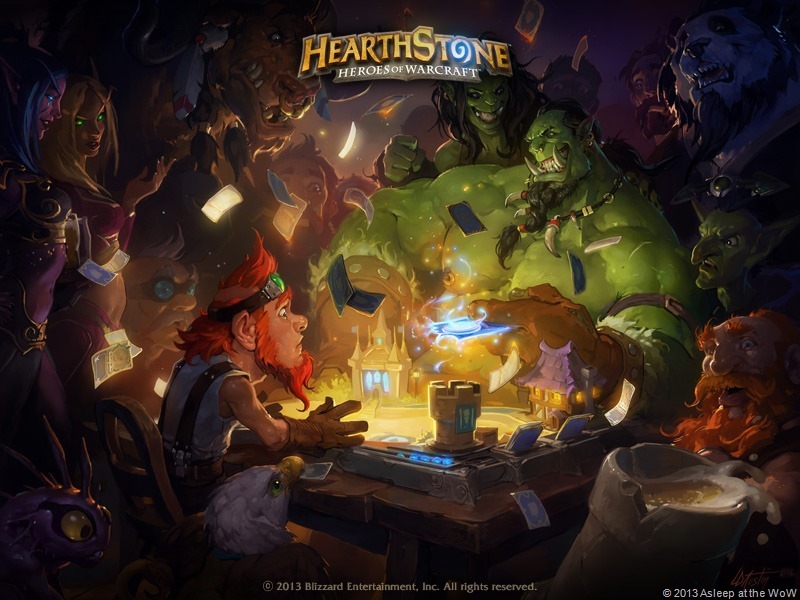 I was not lucky enough to get in on the first wave of Hearthstone Beta invites. Lucky is debatable however; at least I didn’t have to go through the wipe. Stop ( The Stoppable Force ) was awesome enough to give me an extra beta key he received recently and I was able to get in on the ground floor when pretty much everyone else was shuttled back down (or should that be dropped.. ). I have been watching live streams of many different people playing Hearthstone so I already had a pretty good idea what was going on and some of the strategies, etc. Because of this, getting through the first 5 mandatory tutorial games was pretty easy even if I had never actually played before. I was finished quick and moved on to unlocking the races, play and arena mode. I won’t bore you with the details but I spent quite a bit of time playing (not surprising). My first foray into the Arena got me 2 wins before I lost 3 times. I ended up picking the Druid in Arena out of the three offered (don’t remember which the others were) purely on a whim and it worked out ok.
For play mode, I’ve won quite a few games (including 2 ranked games so far). Possibly not surprisingly, I am really enjoying the Hunter style of play using beasts and buffing said beats. I’ve put together a pretty nice “Beastmaster” deck that I’ve been using. I’ve been also trying to level all the other races to unlock their basic cards. That’s it so far. Still playing WoW. Enjoying the 5.4 patch. Finally raiding again (even if it is Flex mode for now) and enjoying it quite a bit. Thanks everyone who’s stuck with me through the lack of updates. I can’t promise that I’ll most any more often than I have been but.. Thanks! Ok. Yes, I don’t just play an idiot on TV (ok, I’m not really on TV) I really am one. I was complaining to Hydra that I would do the weekly resource gathering thing in the Barrens except that I hate having to find a way there. It’s just too much of a hassle.. “Um, why don’t you just take the port from Pandaria?”…. DOH! I had completely forgotten about that port. I used it the first time when I was going through the quest line (I think) but then forgot about it subsequently. 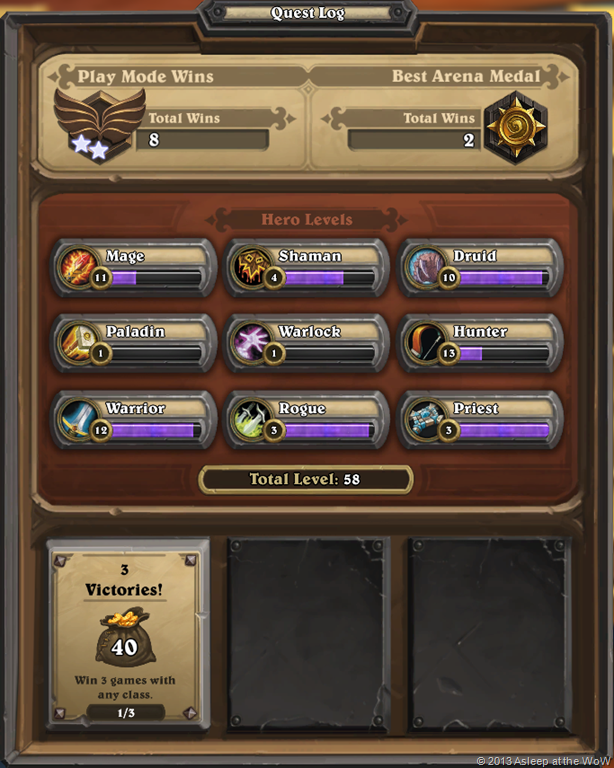 So last night, given that I have not yet gotten into the Hearthstone beta (more on that later), I decided to run out there and get ‘er done. Which I did. Of course, Hydra logged in just as I picked up the last resource I needed and asked if I wanted to join them in farming for them. Well, maybe next week if it is still around. It’s possible this week will be the last week you can do this quest line and if you haven’t done it yet, at least do it for the pet. During the course of my farming, I picked up all the different Latent this and that items. You have to combine those with a Radical Mojo to get an item you can use. 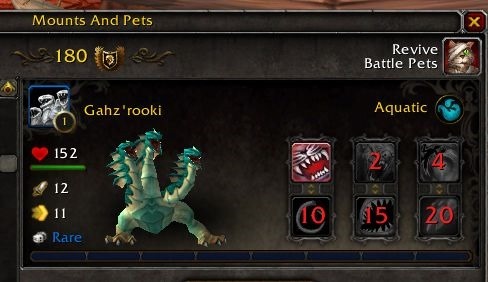 The pet requires one Radical Mojo also though and you get one for each week you turn in the quest. As I only have turned in one (last night), I decided to use my mojo to get the pet instead of the items. If I do complete it this week, I’ll see if one of the items is an upgrade. If not, I might just get another pet and sell it. I don’t think the Level 489 gear would be useful. Blizzcon is inching closer! Last post I did, I talked about them announcing when tickets were going on sale (wow, it’s been that long?). I did get a ticket, so there is that. We WILL be having our party/meetup. 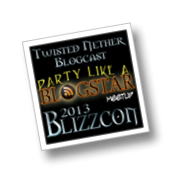 Head over to http://twistednether.net/blizzcon2013 for information about that and let me know if you are coming and I can add you to the list! I’m very excited about Blizzcon this year. Given that we have skipped a year, I think it will make it all that much more interesting. Hopefully they will announce the next expansion for WoW, maybe an expansion for Diablo 3 and let us play the Starcraft 2 Protoss build. We’ll see.. If you are going to be there and want to meet up, the party is the best, but drop me a line and we can figure something out. And, last but not least, Hearthstone! 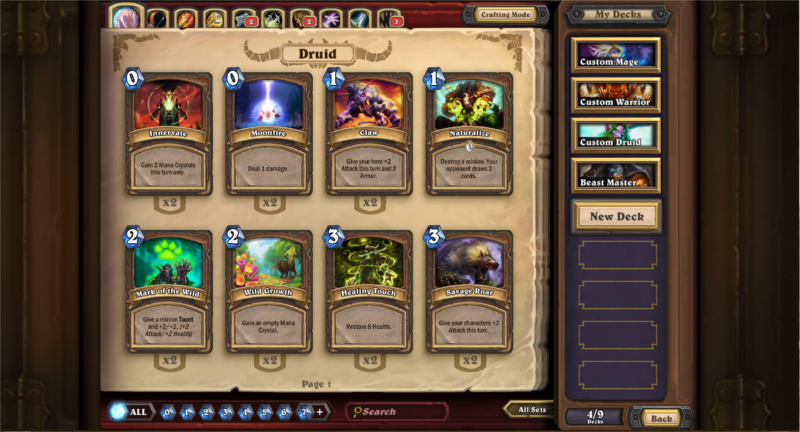 Hearthstone (hit the link up above in the post to see what it’s all about) looks really cool. I’ve been watching a bunch of live streams on Twitch.tv and a few pre-recorded matches on youtube. It seems there is always someone streaming now. I didn’t get a beta invite yet but I’m hoping to get in at some point. I am, of course, worried that I will lose quite a bit of sleep with this thing, but I suppose that’s the price you pay to help out Blizzard in beta testing, right? Anyway, that’s all for now. Sounds like 5.4 and Flex raiding are right around the corner and I may be getting back into a more regular raiding schedule. If so, maybe I’ll remember to post here more often or at least have something somewhat interesting to say. Yes, Blizzcon 2013 isn’t until November but I was just reminded of it today because they announced that tickets ($175 each, limit 4) would go on sale April 24th and 27th. Because of this, I started looking at flights and rental cars, etc. I already booked my hotel room when they announced the dates, of course. We’ve also started the initial planning of the TNB Meet-up. If you are planning on being at Blizzcon, come hang with us on Friday night. All the information will be in that link eventually. Blizzcon is a really fun time and if you are on the fence on whether you should go, I strongly recommend you do. Even if you don’t get a ticket to the show itself and just come to hang out at all the before/after events and maybe get the stream to watch on your laptop in the hotel room. I know we are all wondering what kind of new and exciting things they have in store for us but even just hanging out with everyone is probably the best fun you can have there. If you want to join us in all of our Blizzcon wanderings, just let us know. We’re going to try to be more proactive in our plans so we can get groups together for meals, etc. without the difficulties that have arisen in past years. Alright, I’m outta here. If you are interested, you can check out the photos from our past Blizzcon adventures.